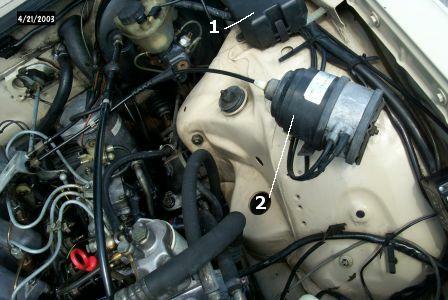 What are these components in a 240D engine compartment? Please help identify the names and functions of the marked (1 & 2) components in the attached image. #1 will probably come to me. It is a cover over some electrical things, and I can't remember off the top of my head what is in there. It might be the cruise control "stuff" (I won't say computer because it isn't). #2 is the cruise control actuator. It has vacuum and wires connected to it, and actually is the part that pulls on the throttle linkage when you are using cruise control. Number one is a relay box. Inside of number 1 are the test connectors for the glow-plugs. You can check your glow-plugs with an ohm meter. I recommend picking up a copy of "HAYNES" M/B 123 manual at the auto parts store. Good pictures and easy to follow steps. I swapped out my rear axles using this manual. It took longer to jack the car; remove the wheels and drain the diff., than it did to change the axles!! No, the glow plug relay is at the lower right of the photograph, you can barely see the corner of it. Number one is a relay box. Thank you all very much for all your help. and electrical aux fans and #2 is the cruise control actuator.